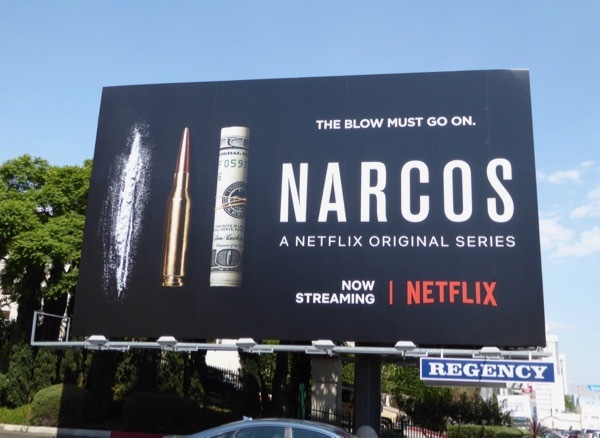 After chronicling the rise and fall of notorious Colombian drug lord Pablo Escobar across the first two seasons, Narcos realizes that 'The blow must go on' and so four new cartel bosses arrive in the third season to take his place. 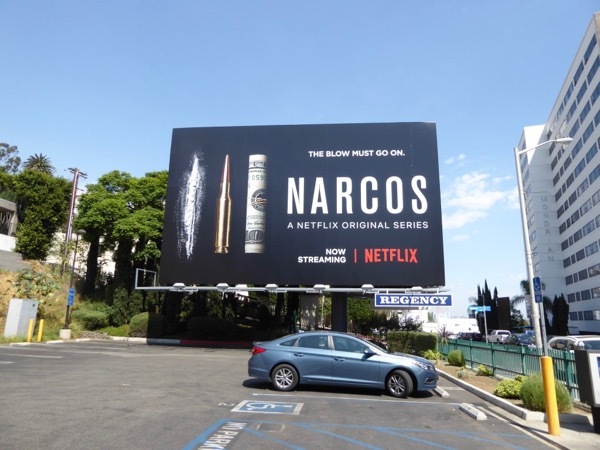 The Cali Cartel bosses trying to evolve the cocaine trade in the 1990s include Gilberto Rodríguez Orejuela (Damián Alcázar), Miguel Rodríguez Orejuela (Francisco Denis), Pacho Herrara (Alberto Ammann) and Chepe Santacruz Londoño (Pêpê Rapazote), with Pedro Pascal's DEA agent 'Javier Peña' striving to bring them all to justice. 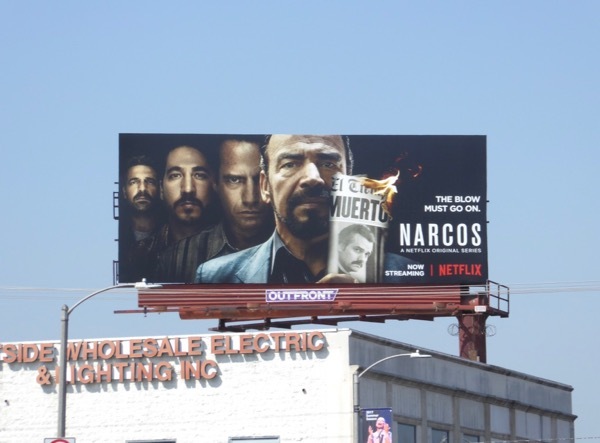 These cool third season billboards were snapped along the Sunset Strip, Santa Monica Boulevard and above Beverly Boulevard from September 1 to September 5, 2017. 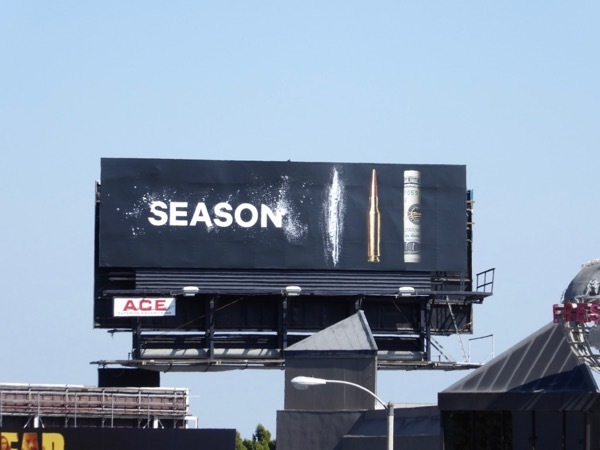 The ad creative with the line of coke, a bullet and rolled dollar bill in a row especially makes for a great representation of the number three. 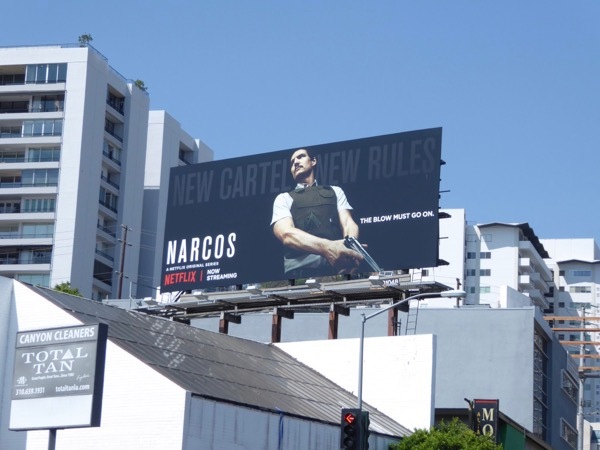 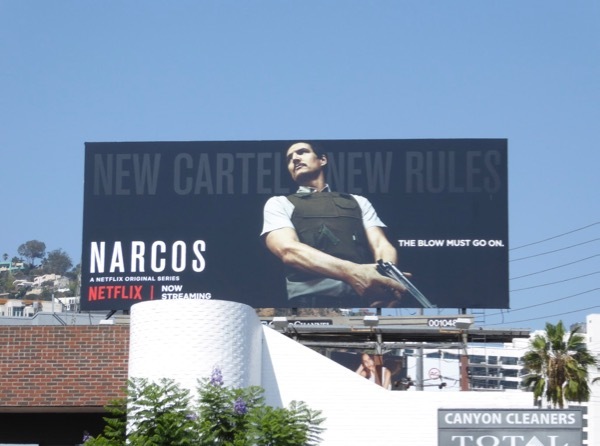 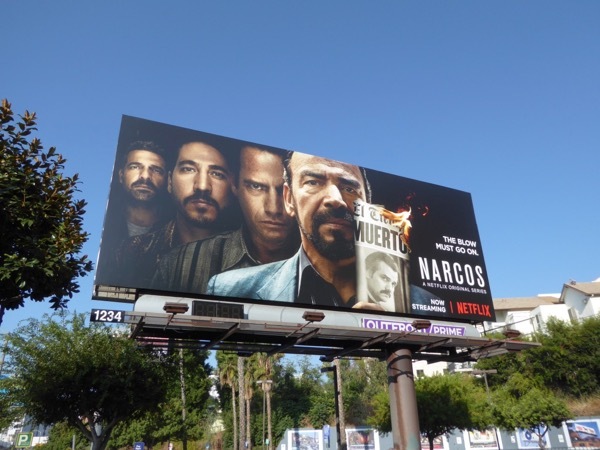 Fans of the gritty Netflix show can also enjoy these previous season promo billboards for Narcos filling the city skyline in recent years. 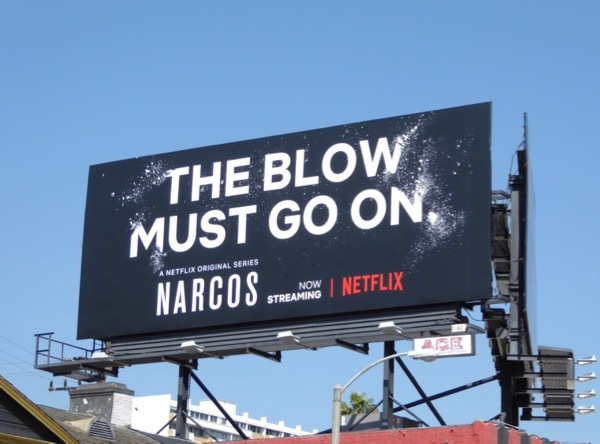 Try not to binge-watch and overdose on the ten new episodes too quickly, as who knows how long we'll have to wait for a fourth season. 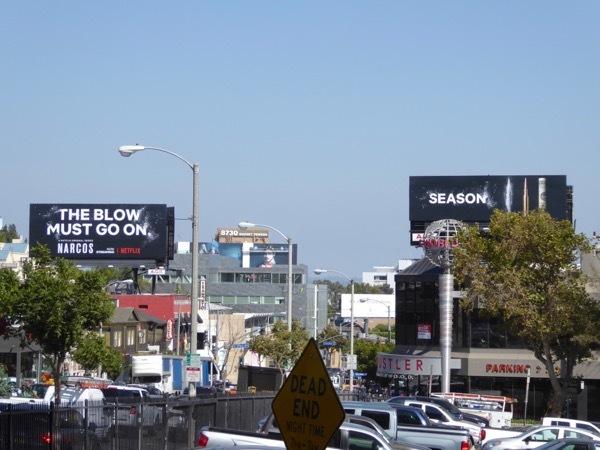 UPDATED: Here's another cool interconnecting duo of billboards for the third season spotted above West Hollywood's Sunset Strip on September 18, 2017. 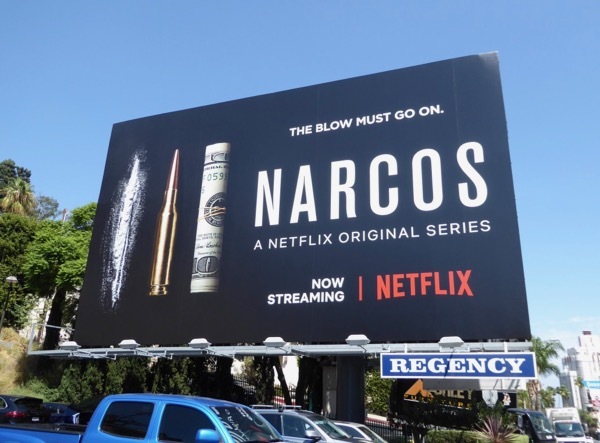 The powdery typeface especially helps to sell the drug cartel-theme of the show, don't you think?